← BWPA Competition – Have you entered yet? It is week’s like this that make salmon fishing so special. 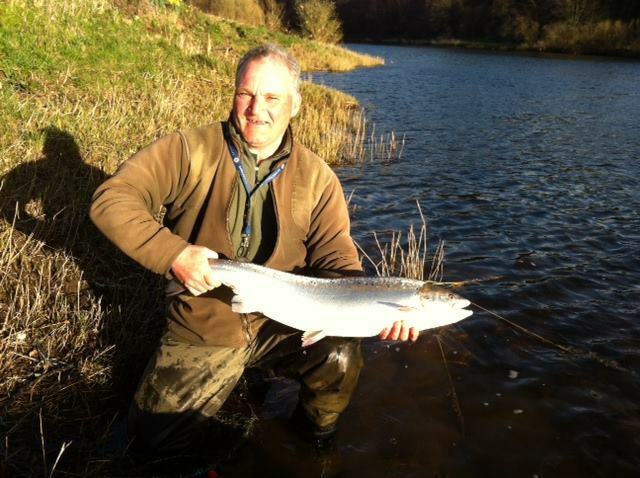 Congratulations Mr Jim Morison who wins the FishTweed Fish Of The Month competition, sponsored by Borders Gunroom. His fish was caught on the Saturday which was the culmination of an amazing week of Spring Salmon fishing on the Junction, during which his party of 6 rods had 49 springers (and landed a total of 106 fish of all classes (kelts, baggots, sea trout etc). The 18lber was based on a length measurement, and was followed by one only a little smaller later that afternoon. The big fish was taken on a blair spoon from the main stream of the Junction pool itself. Of the 16 fish to his rod for that week, 5 were on fly and 11 from either a blair spoon or a blue rapala.